Plant Caddy / Caddie - Terra Cotta - 16'' - Pack of 3 by Plant Stand at Tulips Orchids. Hurry! Limited time offer. Offer valid only while supplies last. Pack of 3 - Terra Cotta 16'' Plant Caddy / Caddie. This planter caddie allows you to easily move heavy pots and plant containers up to 500 lbs. Pack of 3 - Terra Cotta 16" Plant Caddy / Caddie. This planter caddie allows you to easily move heavy pots and plant containers up to 500 lbs. indoors or outdoors. It will accommodate to pots and containers up to 16" in diameter. Just place your container on the Down Under Plant Caddy and once it grows big enough, you can easily move, slide, or rotate it in any direction. No more straining your back moving around heavy pots. 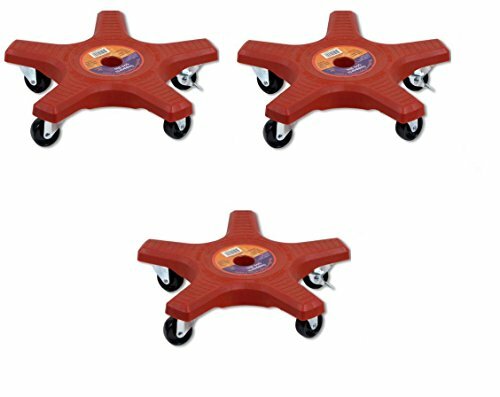 The smooth caster wheels will not mark or scratch your floor. One of the casters can be put in a locked position to prevent the Plant Caddy from rolling off on its own.